True story... I took enough middle school French to enable me to give fish in a paper bag a fancy name. 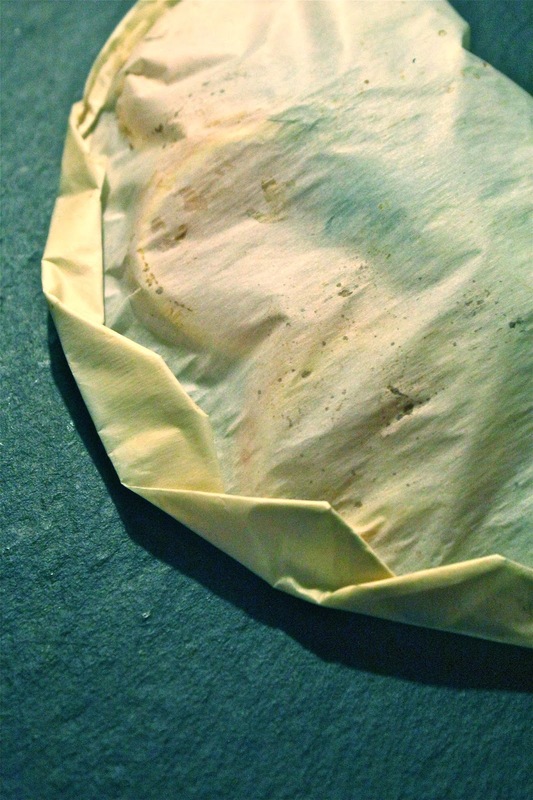 En papillote. I didn't make up the name, it's a classic French cooking technique that gently steams contents and locks in delicate flavor. It's quick, very healthy and makes you feel fancy on a Wednesday night. Since it's a delicate cooking method, it's ideal for flaky fish. You know the kind that sticks on the grill and crumbles when you try to flip in a pan. 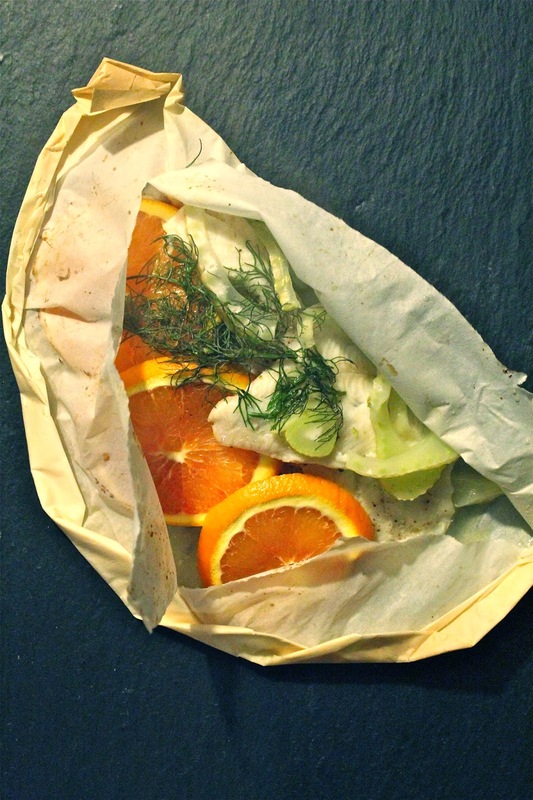 With en papillote you will be the master of flaky fish filets. The combinations are pretty endless, but in the drab of winter, citrus felt bright and delicious. Fennel's sweetness nicely complimented the tart and sole filets absorbed every bit of flavor. Tomatoes and olives would be a good if you were feeling bold and sassy. I did a fancy folding thing here. You can learn how to do it here. But here's a secret... you can do this all with foil. It's not as pretty, but it works just the same and takes no time. Fancy secrets! Preheat oven to 450 degrees. Cut four 15-inch sheets of parchment paper or aluminum foil. Fold sheet in half and place a slice of butter and 1/4 of fennel on the sheet. 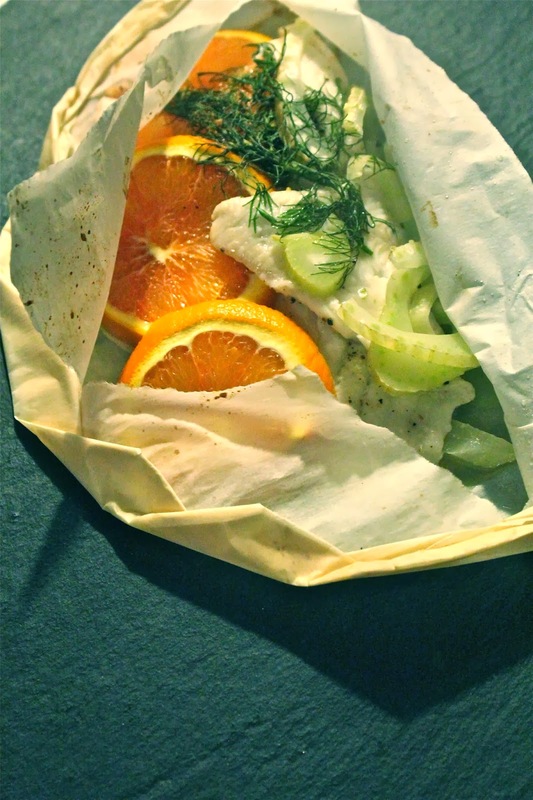 Top with 2 slices of fish, then layer on orange slices, a few fennel fronds and sprinkle with salt and pepper. Fold over foil and tightly crimp edges. Repeat for all four packs. Place packs on two cookie sheets and bake for 8-10 minutes. Open packets table side and enjoy. 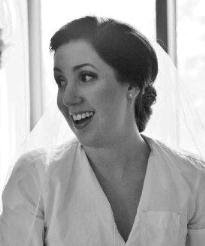 I'm slowly emerging from the Super Bowl black hole. When people think that PR is all glamour and parties, I implore you to visualize me huddled around my space heater, with bloodshot eyes, running on nothing but Diet Coke for days on end. I did it all for the puppy. Good news. Turns out there's more to eat in this world than late-office delivery Jimmy John's sandwiches. What a revelation. After all was said and done, I needed something warm and slightly indulgent. Deeply caramelized, sweet onions with ooey-gooey cheese and crispity-crunchy bread on top. Crispity-crunchy bread with mustard. Yep. The ingredients are humble, but when you don't rush them, they build incredible flavor. There's something about taking your time in the kitchen after a period of rushing in your life that makes you relax. Not rushing is a good thing. 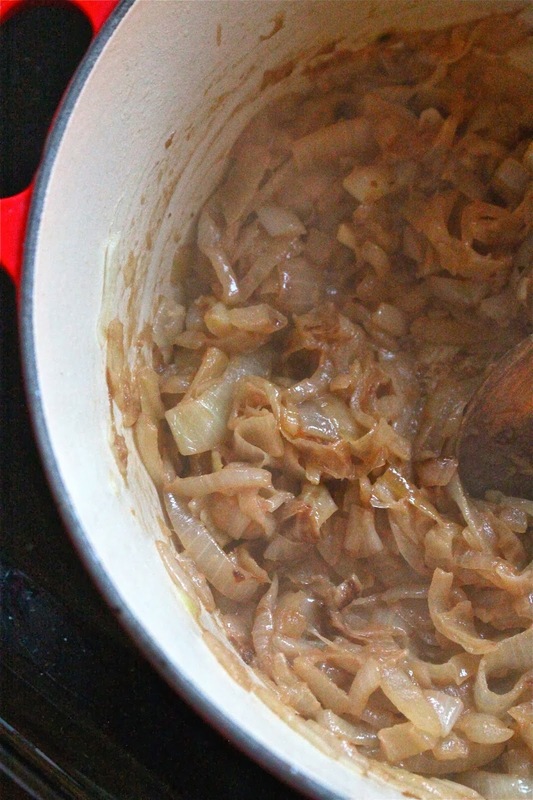 Let's get real, there's no point in making French Onion soup if you're not going to have bread with it. It's compulsory. Simply non-negotiable. 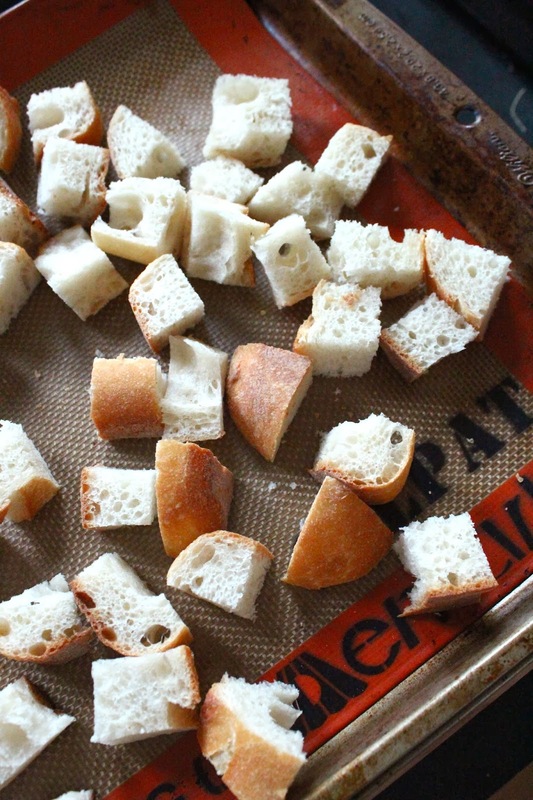 These croutons pull from another classic French flavor, dijon mustard. I beg you not to use packaged croutons. Woof. They're incredibly easy to make and exponentially more delicious. Simply toss in olive oil, dry mustard and dijon mustard. 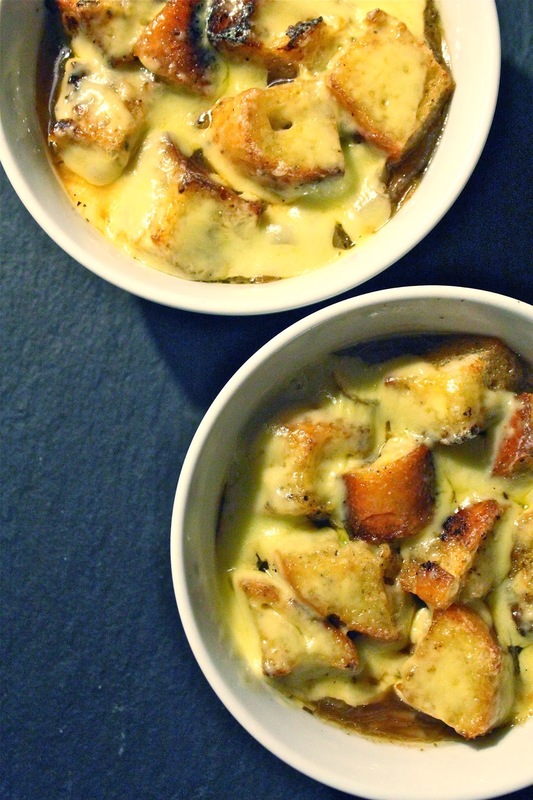 You'll make soup just to have the excuse to make these. With a quick melt of cheese atop the soup, you're ready, unrushed and hopefully revived. You made it. Heat butter in a large pot over medium-low heat. When melted, add onions and stir to coat. Cook onions until soft and beginning to brown, about 45 minutes to an hour. 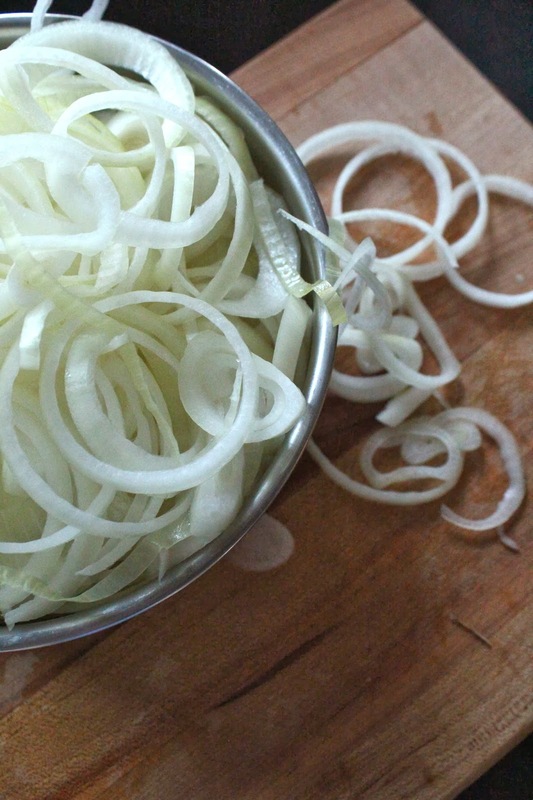 While onions cook, prepare croutons. Preheat oven to 400 degrees. 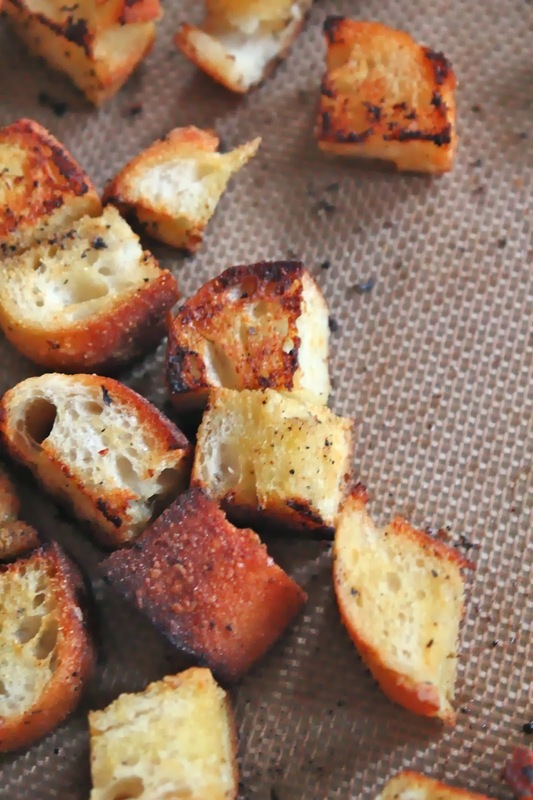 On a large baking sheet, toss bread cubes with olive oil, dried mustard, dijon mustard and a sprinkling of salt and pepper. Bake for 5 minutes and toss. Bake for another 5 minutes until a golden brown color is achieved. 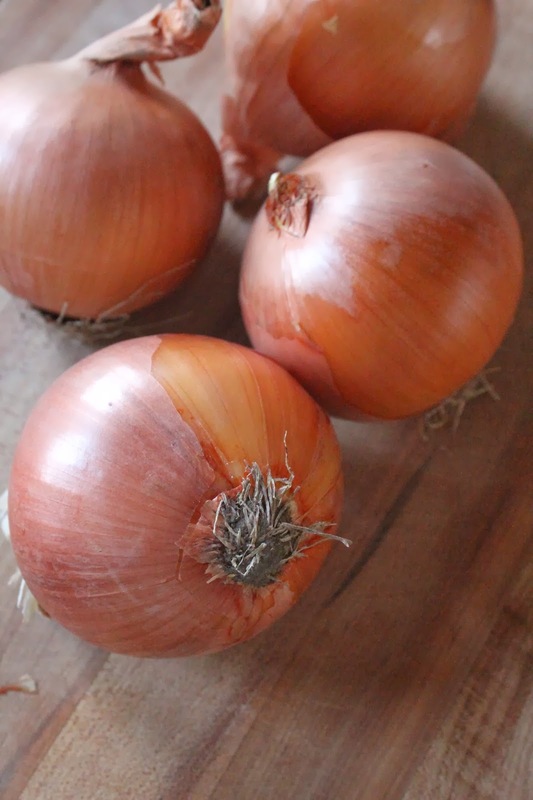 Once the onions are a deep, caramel brown color, add beef stock, white wine, thyme, bay leaves, 1 teaspoon of salt and a 1/2 teaspoon of pepper. Bring to a boil and then simmer for 15 minutes. Remove bay leaves and thyme sprigs. 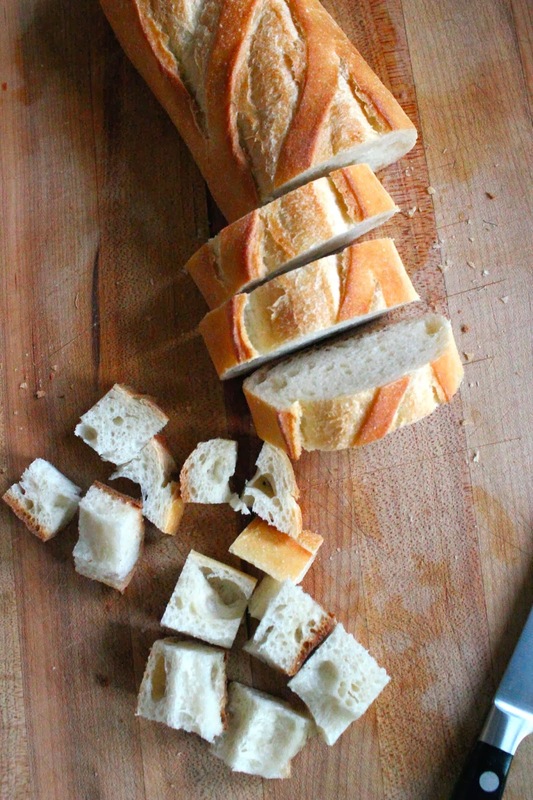 Ladle soup into four ovenproof bowls on a rimmed baking sheet. 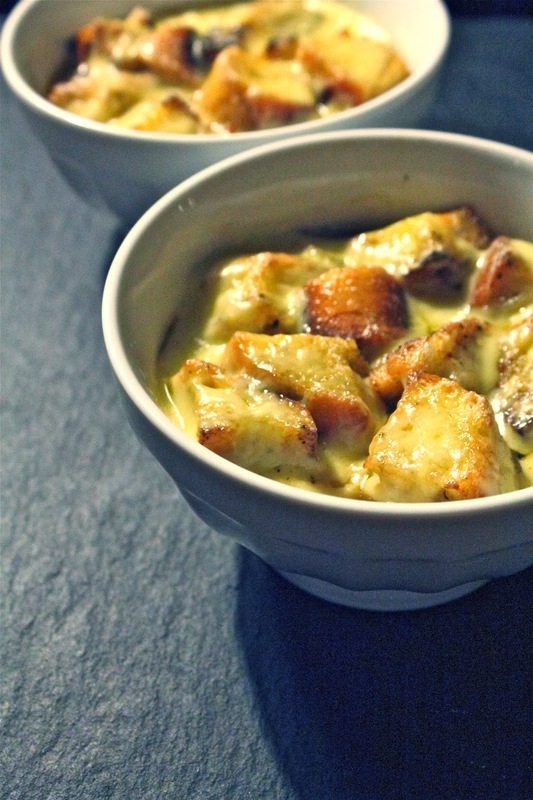 Top with a handful of croutons and a slice of cheese. Bake until cheese melts. Dig in and enjoy! Soup recipe adapted from Mark Bittman.